1. Are Reinvested Dividends & Capital Gains Taxable in a Roth IRA? 3. What Is Considered Qualified Earned Income for a Roth IRA? Designing a custom-tailored retirement plan that suits your specific needs may send you on a search to consider a variety of financial options, including their associated tax implications and eligibility requirements. Investments, pensions, Social Security benefits and retirement accounts commonly top the list of income sources that help ease taxpayers from the workforce to their retirement years. One retirement vehicle – a Roth Individual Retirement Arrangement (IRA) – could be your go-to option if you don’t want to be saddled with paying income tax when you withdraw eligible funds. When Congress passed the Taxpayer Relief Act of 1997, this legislation set in motion one of the largest tax-reduction and tax-credit set of benefits in the country’s history. Among the sweeping tax reforms of this legislation was the creation of the Roth IRA, which was a different type of individual retirement account than had previously existed. Named for the late U.S. Senator William V. Roth Jr. of Delaware, who sponsored the legislation that created his namesake IRA, this new type of retirement account gave taxpayers the option of investing already-taxed income that they could withdraw tax-free. A Roth IRA allows taxpayers a way to save money that they'll receive when they retire from the workforce. Although the goal of a Roth IRA is similar to the goals of other retirement accounts – putting aside a nest egg to enjoy when you retire – the path to accomplishing this goal is different. Other types of retirement accounts allow you to make tax-deferred contributions. You won’t pay income tax on the money as you deposit it into your account, but you’ll have to pay income tax when you withdraw the funds. A Roth IRA, however, is structured in the opposite direction. You'll pay income tax on the funds before you deposit them into your Roth IRA account, which yields a nice surprise at the end of the retirement tunnel – you won't owe a single penny of income tax when you're ready to withdraw your funds. And don't forget about the interest your Roth IRA account earns – it also grows tax-free. More than 20 years before Congress signed the Roth IRA into law in 1997, traditional IRAs were already established. In 1974, with the passage of the Employee Retirement Income Security Act (ERISA), taxpayers were able to make contributions to a retirement account, which became commonly known as the “traditional IRA.” This IRA was the forerunner of other types of individual retirement accounts, including the Roth IRA. Unlike a traditional IRA, which requires its account holder to make minimum annual withdrawals after reaching the age of 70 1/2, a Roth IRA does not have an age limit or time restriction on required minimum withdrawals. 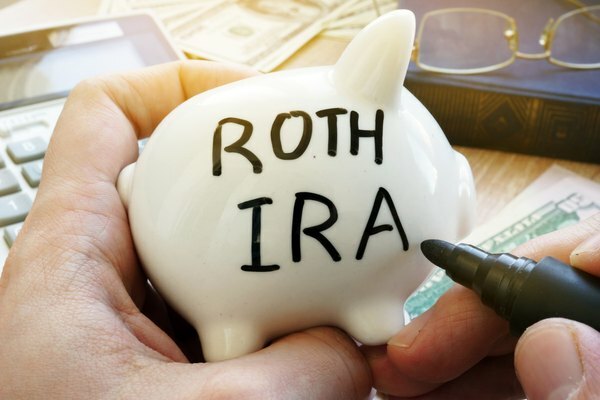 In stark contrast to a traditional IRA, a Roth IRA does not even require the account holder to withdraw funds at any time, which means that you can keep your funds in your Roth IRA account for your heirs. A notable difference between a 401(k) retirement plan and a Roth IRA is that a 401(k) is considered a “workplace savings plan.” This means that your employer deducts an authorized amount from your paychecks to contribute to the plan for you. And employers often supplement the funds you invest by making additional (often matching) deposits to your account. Just like a traditional IRA, although the money you contribute to a 401(k) plan is tax-free going in, you’ll pay income tax when you withdraw your funds. But a Roth IRA does not involve your employer; you can be self-employed or employed by someone else and still open a Roth IRA. The income you earn is what makes you eligible to open a Roth IRA account – with an emphasis on “earn.” To qualify for a Roth IRA account, you must have “earned income” instead of “unearned income.” Earned income sources, which are Roth IRA-allowable, include wages, salaries, commissions and self-employment income. Unearned income sources, which are not Roth IRA-allowable, include interest income, dividends and pensions. IRS-allowed unearned income exceptions are payments you receive for taxable alimony or separate maintenance income. Your income and tax filing status determine your eligibility to contribute to a Roth IRA. The IRS considers your modified AGI (adjusted gross income) in determining your eligibility. To calculate your modified AGI, use Worksheet 2-1 that’s contained in IRS Publication 590-A (Contributions to Individual Retirement Arrangements [IRAs]). Visit IRS.gov/forms and search for this publication by name or number. Follow the prompts to view, download or print the worksheet. Single, head of household or married filing separately (you must have lived separately from your spouse for the entire tax year). You can make contributions to your Roth IRA if your modified AGI is less than $133,000. Married filing separately but you did live with your spouse for any part of the year. Your modified AGI must be less than $10,000 to contribute to a Roth IRA. Married filing jointly, or qualifying widow(er) your modified AGI must be less than $196,000 to contribute to a Roth IRA. If you meet IRS income requirements, you’ll also have to stay within the IRS contribution limits, or you may have to pay a penalty. These limits change, depending on any changes to tax law. For tax years 2015 through 2018, the maximum you can contribute to your Roth IRA is $5,500 (or $6,500 if you’re age 50 or older). For the 2019 tax year, increased contribution amounts are $6,000 (or $7,000 if you’re age 50 or older). Two important rules apply to these contribution limits: 1) the maximum you’re allowed to contribute cannot be more than your annual taxable income, and 2) these limits represent the total combined contributions to your traditional and Roth IRA accounts. The deadline for contributing to your Roth IRA does not end with the last day of the calendar year. You have until the tax filing deadline of April 15 (or the next business day if April 15 is on a weekend or federal holiday) to make your last contribution for the tax year. (You can make multiple contributions to your Roth IRA during the year or a single payment.) If you request an extension to file your return, the extension does not apply to your Roth IRA contributions. Unlike other types of retirement accounts, you can withdraw any amount of the contributions you’ve made to your Roth IRA at any time, penalty-free. But there’s a difference between “contributions” and “earnings.” While “earnings” represent the interest you’ve earned, “contributions” represent the actual dollar amount you’ve deposited into your Roth IRA. After you’ve reached the age of 59 1/2, and you’ve held your Roth IRA for at least five years, you can also withdraw any amount of your earnings, penalty-free. But if you’re under the age of 59 1/2, you’ll have to pay a 10 percent penalty plus income tax on any amount of the earnings you withdraw from your Roth IRA. Are Taxes Owed on a Roth IRA Withdrawal? Are Gains on a Roth IRA Taxable? Will I Be Penalized for Withdrawing From a Roth IRA if I've Had It at Least 5 Years?